Only a few weeks left until summer and my lilac bushes finally decided to bloom. Out of 14 bushes, only the one with white lilacs had opened up last week. The others remained tightly closed, or looked as if they weren't going to bud at all. When I drove up to the house yesterday evening, all the bushes had open blooms on them. Seemingly overnight both flowers and butterflies exploded outward to worship the sun. After a spring with good water, the bushes are heavy with flowers, a sight for eyes weary of the slow unfolding of spring. I stop on the way in the house to inhale the aroma of lilacs. The purple lilacs crisp and refreshing, the pale purple a bit faded with grassy undertones, the white lilacs a deep and intoxicating scent that sears itself into my brain. In the rest of the yard, the cottonless cottonwood looked dire, no buds we could see last week. Had it been winter killed? Suddenly yesterday I saw leaves everywhere. big enough to hide the little birds that sang to me in the morning. I had given up on Mother Nature, but she had not given up on me. Little by little late spring blooms unfold, and baby animals cavort in green pastures. I store up the sights and sounds - and smells - for the days when inevitably the landscape grows dry, colors fade to olive and brown, and the predominate smell is that of wildfire on the breeze. I take some time each day to step outside and devour the sights and smells. I snap pictures with my phone but that isn't enough to preserve the season. Mother Nature moves forward, whether I like it or not. My brain is the greatest recorder of the seasons, and I try and fill every nook and cranny so I can remember the pollen dusted wings of a Monarch butterfly, the contented buzz of a bumblebee at work, and the heavenly scent of lilacs wrapped around me like a spring shawl. My fickle heart already turns toward summer, and wonders what sights, smells and sounds will trickle inward, ready to be preserved for the white page of winter. I love lilacs. Here we have very protracted springs and Autumns and there have been seasonal flowers this year all the way through from January 'til now with the hedges heavy with hawthorn and its scent. Now the rhododendrons are out and roses are starting to bloom. Of course we do get a lot of rain, and it's mostly cool. Also now we have the long evenings -- light until 10:30pm light again at 2:30am and it's not even the longest yet. Lilacs remind me of home, my grandmother, the days before school let out for the summer. All good things. We don't get light near as long - but we will get an eclipse. Thanks for sharing, Oonah. Always curious about life on the other side of the pond. 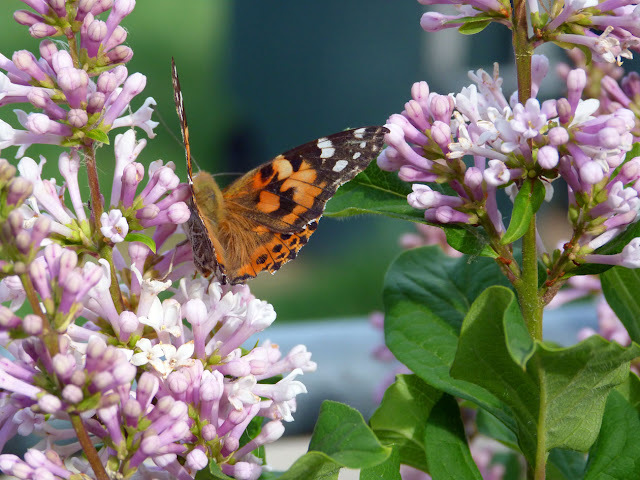 What a beautiful piece of writing about those lilacs! Our lilacs are done now, as are the bleeding hearts. We have columbine, meadow sage, and prairie smoke in bloom, and fat buds on some other perennials in our garden. The rabbits ate all my poppy heads this year - I didn't have many to begin with. The scent of certain flowers and how they connect to our memory is fascinating and a great trigger for poetry. Saunter on.